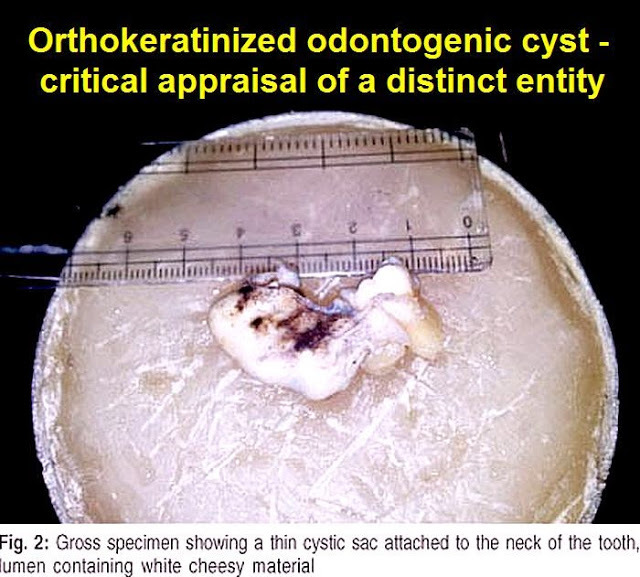 It has long been documented and established that in addition to odontogenic keratocyst (OKC), the majority of odontogenic cysts produce orthokeratin. 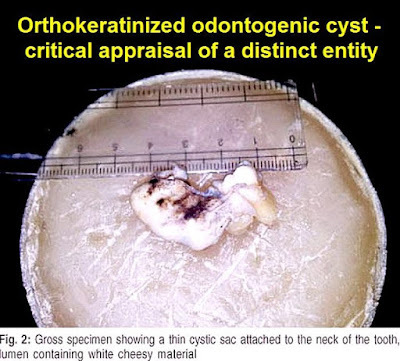 Although orthokeratinized odontogenic cyst (OOC) was first described as early as in 1927 by Schultz1, it was first considered to be a variant of OKC. However, with the World Health Organization (WHO) redefining OKC as a neoplasm and redesignating it as keratocystic odontogenic tumor (KCOT) in 2005, it became imperative that OOC had to be separated out from KCOT as a distinct entity. This distinction was germane as the pathogenesis and the progression and prognosis of these two seemingly similar odontogenic cysts is diverse. Equally bewildering of OOC is its resemblance to a dentigerous cyst when it occurs around the crown of an impacted tooth. This report presents a case of OOC in relation to an impacted mandibular third molar and discusses its possible pathogenesis.